It’s been a very long while since I last wrote here. One reason is the trash circus better known as the presidential campaign of 2016. Though I am an independent moderate, the election of Donald Trump has shoved me further toward the left than I care to think about. I am no longer certain I can bridge certain extremes. And I am frankly still too angry to try. But the chief reason is a certain bit of misfortune that occurred to me last Memorial Day weekend. 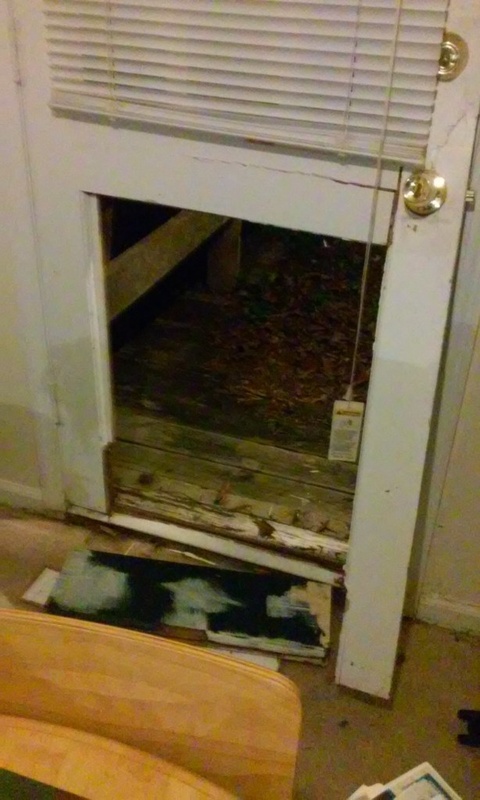 Yes, that’s my door, and yes, it was kicked in. And yes, my computer (and PS3 and my brother’s PSP) and all my files on it were stolen. Bereft of my equipment to write or even gain internet access, I let said access lapse and have since enjoyed not paying that bill. But the cost has been no ability to write. Not at length. And of course I’ve missed it. I’ve missed a number of things. Therefore, when National Novel Writing Month rolled around again this year, I planned to take part. Usually, November catches me rather by surprise and I find myself having forgotten that NaNoWriMo is happening and I never participate. But not this year. This year I had a story idea in mind and had even started to outline. But again, there will be no novel writing. I found myself pining to return to this Bridge Over Troubled Opinions blog (and to its hobby-minded sister, Heroclixin.com). I have too much on my mind and Facebook just doesn’t cut it as an outlet or repository for it all. And the less said about — or on — Twitter, the better. If only that dude in the Oval Office could get that idea into his yellow-coifed skull. Can “Justice League” continue the redemption of the DC Comics movies that “Wonder Woman” started?